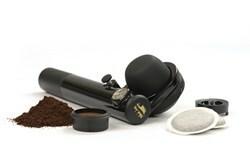 Good news for the coffee lover on-the-go -- Handpresso’s series of portable espresso makers and accessories are now available at TotalHomeSupply.com. What makes Handpresso’s products so great is how convenient and versatile they are. Total Home Supply is pleased to announce their new partnership with Handpresso, a company that specializes in making the coffee-brewing process simpler and more accessible to consumers on-the-go with their line of handheld, portable espresso makers. Each item is compact, lightweight, and incredibly easy to use, for all the joy of a freshly brewed cup of espresso with added convenience and portability. Currently, Total Home Supply carries two of Handpresso’s highly-acclaimed espresso makers, the Wild Hybrid and the Handpress Auto, both of which require no extra steps beyond adding water, adding coffee, and serving. The Wild Hybrid espresso maker requires no electricity to operate and is great for use in the office, hotel rooms, or in small apartments where kitchen counter space is limited. The Handpress Auto is shaped specially to fit in the car’s cup holder, conveniently plugging into any 12V cigarette lighter, brewing piping hot and flavorful espresso in minutes. Both espresso makers may be used with ground coffee or E.S.E. (easy serving espresso) coffee pods. Also available for purchase at TotalHomSupply.com are Handpresso espresso maker accessories, including a protective travel case for the Wild Hybrid coffee maker and a Thermo-Flask portable thermos to keep hot water. A complete outdoor espresso kit that includes the Wild Hybrid and Thermo-Flask products as well as four unbreakable espresso cups is also available, as is an additional portafilter add-on for brewing Ristretto (or “short”) shots of espresso.